As a staple of the world of Marvel comic books, could it be time to shake up the formula of established egos once more? It's time to stick on our spacesuits and shoot for the stars, because the Guardians of the Galaxy are about to step into the spotlight once more. As a staple of the world of Marvel comic books, could it be time to shake up the formula of established egos once more? Since their inception in 1969, there have been some 30 members who have saved the day under the official "Guardians" moniker, with some of the strangest additions being the likes of Iron Man, Captain Venom, and Thing. With an already established team of favorites thanks to the #MCU's movie series, it now looks like another famous #Marvel face is about to join the ranks. At first glance, you may think that Marvel has done a misprint, with the cover only seeming to show Man-Thing, Doctor Strange, Deadpool, and Cable, however, do you spot the person lurking in the background? Looking at Man-Thing's left shoulder, eagle-eyed fans will spot Ant-Man hiding in plain sight. Interestingly, this latest iteration of the team also led into the ever-expanding world of Guardians movies. We already know that the MCU intends to use James Gunn's Vol. 3 as a jumping-off point for more cosmic Marvel movies, so this mystery male may be primed to make his way onto the team for the big screen. The upcoming #InfinityWar sees Thor sharing some time with Star-Lord and co., and although it is doubtful that the God of Thunder will become a fully fledged member, it shows that Feige and the rest of the bigwigs aren't afraid of making the Guardians more mainstream. We are also promised that the "current lineup" of Guardians will likely change after Vol. 3, so it is anyone's guess who (if anyone) will move over from the old era of space scoundrels. Either way, with the current team being the same since 2008, a bit of new blood might spice up the comics. 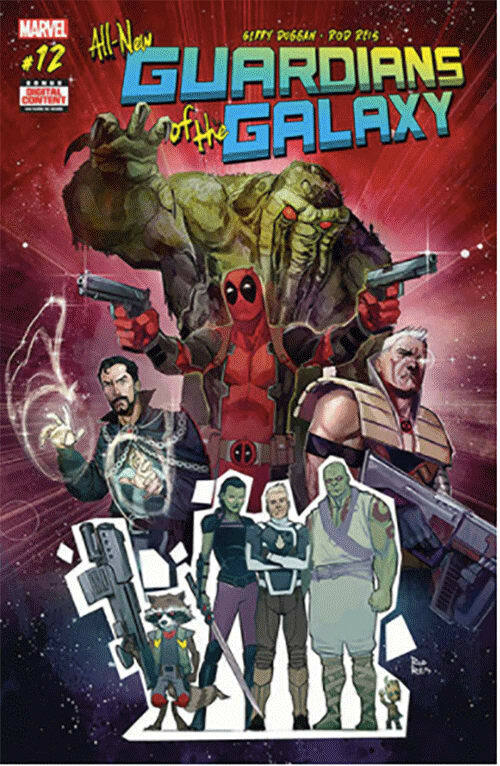 There is still a bit of a wait to go, but All-New Guardians of the Galaxy #12 will go on sale on October 8. Read next: Tony Stark Puts 'Training Wheels' on Peter Parker's Superhero Suit in 'Spider-Man: Homecoming,' but What Are They?